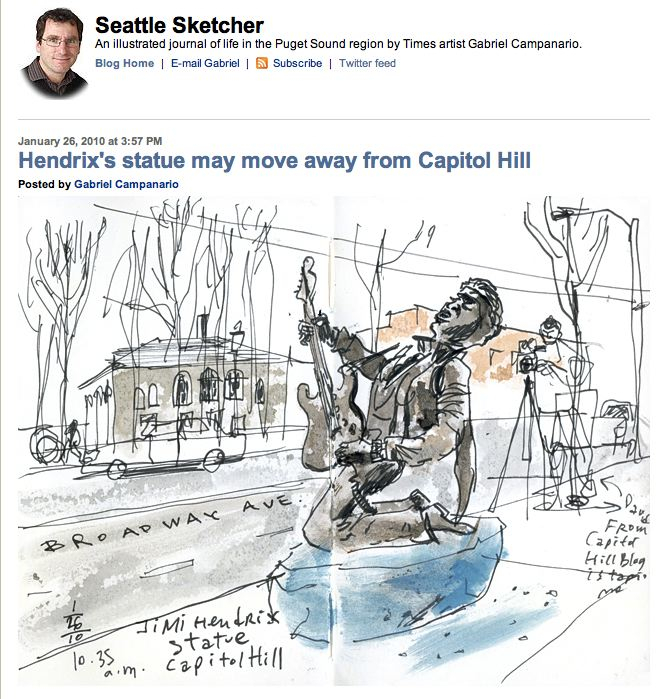 A few years ago I produced a video for the Capitol Hill Seattle Blog on Gabriel Campanario AKA Seattle Sketcher, whose sketches appear in his column for the Seattle Times. Then, a few months ago I got a call from the Museum of History and Industry, asking to use my video in an exhibit of Campanario's work. Of course I said yes. The exhibit, "Drawn to Seattle," opened on Dec 21 and runs through May 26. The video is below, and to the left are some photos I took at the Member Reception for the exhibit. That's me shooting in the sketch on the left! 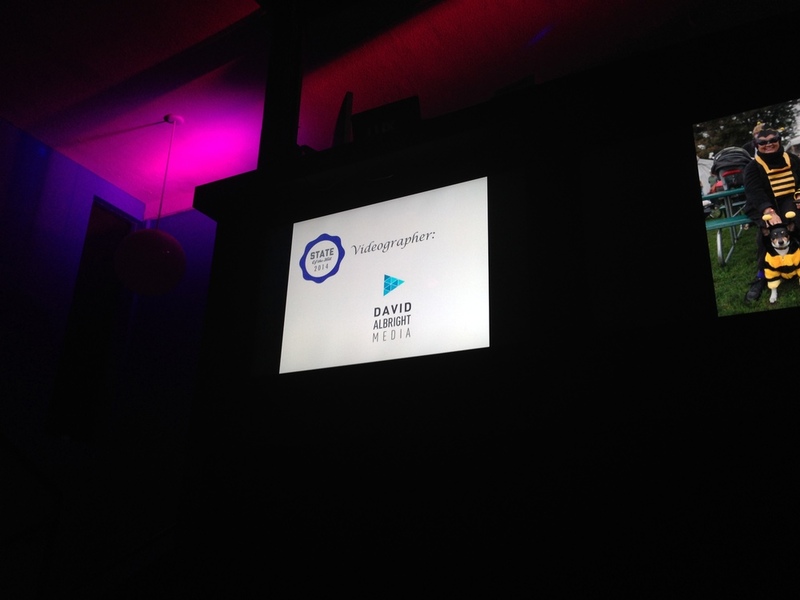 UPDATE: awww, jseattle says I'm CHS's "favorite neighborhood videographer" ! I may have gotten a little carried away with the edit, but it's Rammstein how could I not?! Just over a year ago, I went out and shot this "I Love My Bike Book" video for CHS. It was completely spur of the moment, I saw Justin's tweet about these guys being down at Cal Anderson so I went down and shot for an hour or so, and then had the video up the same day. Since then the video has been all over the place, instead of the usual spike in views for a couple days and then quick drop-off, this one has been pretty consistent over the past year. I don't know if I'd say it's gone viral but it's definitely made a lot of appearances on various blogs and bike forums and as of today has over 5,000 views. Anyways... the Book is out! I just got my free copy in the mail, and the publisher, San Fransisco's Chronicle Books, is featuring my video. So go check it out! My tweet yesterday about my bus catching on fire, made the (hyperlocal) news! 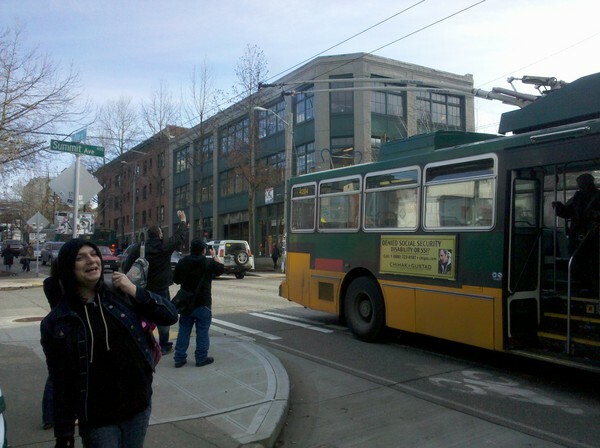 ... "Wire fire grounds 49 bus on Capitol Hill but Metro says old electric trolleys are hanging in there." CHS (Capitol Hill Seattle Blog), has been selected by the Society of Professional Journalists as the best hyperlocal news site in the Pacific Northwest. Although it's been a while since my last post I've been pretty regularly producing videos for the site for the past year and a half. Congrats to editor Justin Carder who runs the site and produces most of the content. And I'd like to think the videos maybe had a little something to do with it too! Here's a video about CHS that I made way back in December 08. Saw Justin (CHS Publisher) post a tweet about this I Love My Bike photo session at around 2pm on Friday. I was down there shooting by 3, back home editing by 5, and had the video published by later that evening. One thing I'm trying to get better at is being able to throw videos like this together quickly, which is necessary for journalism, and also to lower the cost for the many small businesses that are starting to produce video. It's definitely a bit harder with my EX1 to just run out and start shooting than it was with my Panasonic DVX. Focus and exposure both take a bit longer to get just right than with the DVX. But I've found that with HD, color correcting seems to be much more forgiving. In a couple of shots here I thought the sky was totally blown out, but after color correction I was able to bring back some of the detail and even a bit of color. With the DVX footage, if it looked blown out it was blown out, there was usually no salvaging it. I also now know to be more careful about the shotgun mic dipping into the shot when using the wide angle lens. duh. Couple new things on CHS.. I posted my Top 9 Cap Hill Videos of 2009, which include a couple of my own videos, but mostly others'. And I took the 9 snapshots I did over the past couple months and mashed them all up into one final year end Snapshot. This may or may not be the end of the snapshot series, at least in it's current form... not quite sure yet. I'm trying something new over on CHS. I'm currently working on a story for them about the closure of Bailey Coy and the future of Bookstores in general in Capitol Hill and beyond. Instead of just collecting all the interviews and b-roll and then editing it down to a 5-10 minute feature to show publicly... I'm going to be putting almost all of the content on CHS as I shoot it. I put up my interview with owner Michael Wells a couple weeks ago, and I just put up some interviews and footage I shot at the wake last night. I have some more interviews and shoots to go, which I'll also be posting, then eventually I'll be editing it together into a traditional longer form piece. Why am I doing this? Well for one, putting together a video feature takes a lot a long time, but the blog format of CHS favors fast turnaround, short and to the point content. Lately I've been kind of struggling to answer the question... Am I documentary director, or a video journalist? I guess if I'm asking the question I must be somewhere in between. So doing this kind of 'open reporting' allows me to be a part of the real-time journalistic conversation, but also lets me make the longer form, higher production value documentary shorts that I really love doing. Also, with documentaries, there ends up being a ton of content that doesn't make the cut and is usually never seen. This is a way of getting all that content out there for those that really want to get deeper into the subject. Posting the content like this will give viewers the chance to follow along with the story as I'm developing it, and I'm hoping that'll allow them to contribute ideas that can make it into the final documentary. I'm hoping that viewers might suggest additional interviews to conduct, questions to ask, or even new ideas that could take the story in a whole new direction.